What is the Sussex County Comprehensive Plan? The Sussex County Comprehensive Plan is the roadmap that guides decision making in Sussex County. It is a blueprint for policy and decision-making on issues including transportation, utilities, land use, recreation, natural resource protection, housing, historic preservation, and economic development. Thoughtful planning on these issues is critical to protect good quality of life in the Inland Bays watershed. 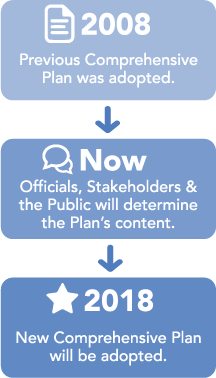 Between now and June 2018, officials, stakeholders, and the public will all have the opportunity to express their concerns and share their ideas for what should be included in the new Comprehensive Plan. This is your chance express your concerns where it really can make a difference! UPDATE: As of December 2018, the Sussex County Council has adopted the 2018 comprehensive plan update, which serves as vision for county’s future. During the first phase of this process, the County will provide opportunities for the public to be involved via (1) public meetings, (2) the Sussex Plan website, and (3) social media. When you share an idea, it’s officially recorded, and all the ideas become part of the planning and discussion as the Plan is worked on. Please note that all comments are part of the public record and subject to requests under the Freedom of Information Act. Want to share your thoughts in person? Join in on a Public Open House or Forum, held regularly. Details are available on the official Sussex Comp Plan website. Can’t make Public Open Houses? Sussex Plan webpage to participate! Stay up-to-date with the Sussex Plan on social media, submit comments, or ask questions at the links below. The CIB with input from the Citizen’s Advisory Committee has identified issues of priority concern that should be part of the Sussex County Comprehensive Plan to protect the Inland Bays, their rivers and creeks and the land around them. If you share these concerns, please include these issues when you provide your input to the county. We will continue to update this information with additional links in coming months. CCMP ACTION: Revise the existing Sussex County Ordinance on water quality buffers to be in line with the CIB’s Recommendations for a Water Quality Buffer System. RECOMMENDATION: Increase the pace of conversion of septic systems to central sewer. CCMP ACTION: Develop a wastewater planning committee comprised of DNREC, Sussex County, utility industry representatives, and other stakeholders to coordinate the treatment and disposal of wastewater from new and existing developments based on the TMDLs of receiving waters. CCMP ACTION: Encourage Sussex County and/or municipalities to create a stormwater utility to fund stormwater facility maintenance and stormwater retrofits. CCMP ACTION: Develop maximum impervious surface coverage targets to protect aquatic life and urge their inclusion into county and municipal comprehensive plans. INLAND BAYS WATER USE PLAN ACTION: Acquire available waterfront property to ensure public access to the bays is maintained and enhanced. CCMP ACTION: Work with the County and municipalities to incorporate sea level rise into comprehensive plans. CCMP ACTION: Implement the recommendations of the State Sea Level Rise Advisory Committee relative to the Inland Bays. As an estuary of national significance designated by the federal Clean Water Act and as state waters of exceptional recreational and ecological significance designated by the state water quality standards, the Inland Bays and their watershed should be afforded the highest level of protection and conservation of natural resources within the County’s Comprehensive Plan.